Successfully Added VAKI-X5C Remote Control Quadcopter - 2.0MP HD Camera, 4GB Micro SD Card Slot, 6 Axis, Remote Control to your Shopping Cart. Take to the skies with a portable 6 axis quadcopter featuring an HD camera and see the world from a bird's eye view. Take stunning photos from the sky with a swift quadcopter featuring a 2.0MP camera with 4GB of storage. The 6-axis quadcopter is super easy to control and will obey your commands in an instant. Coming with a 2MP HD camera, it will not only give you stunning ariel shots, but also record quality footage from the sky. The quadcopter is perfect for first time pilots, as it comes with a convenient remote control featuring an LED screen and control distance of 15 to 30 meters. You will be able to easily adjust the flying speed between high and low + the drone comes with a 360 degree aversion function. 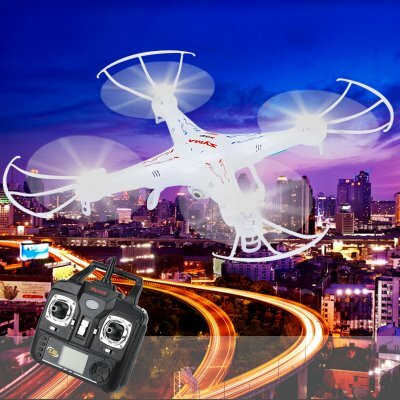 The 500mAh battery guarantees about 8 minutes of uninterrupted time in the air and the colorful LED lights make sure the quadcopter will be easy to locate in the sky even after sundown. Easy-to-use and compact, the 6 axis quadcopter would make a great companion for nature outings, hikes, picnics and camping trips. For kids, it can be a great and safe tool to learn about the world around and a fun gadget to play with outdoors. The VAKI-X5CQuadcopter brought to you by the leader in electronic devices as well as wholesale quadcopters..